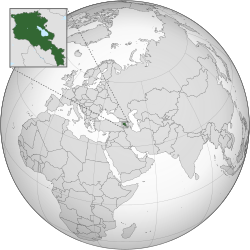 ↑ "The conversion of Armenia to Christianity was probably the most crucial step in its history. It turned Armenia sharply away from its Iranian past and stamped it for centuries with an intrinsic character as clear to the native population as to those outside its borders, who identified Armenia almost at once as the first state to adopt Christianity". ( Garsoïan, Nina (1997). in ed. R.G. Hovannisian: Armenian People from Ancient to Modern Times. Palgrave Macmillan, Volume 1, p.81။ ). ↑ Grousset, René (1947). Histoire de l'Arménie, 1984, Payot, 122။ . Estimated dates vary from 284 to 314. Garsoïan (op.cit. p.82), following the research of Ananian, favours the latter.